The congregation of the Gerrardstown Presbyterian Church, organized in the winter of 1793-94, became one of the constituents of the Winchester Presbytery in December 1794, under the name of Middletown. The name of the community, and therefore the congregation, was changed in 1824 to Gerrardstown in honor of the founders John and David Gerrard. The first Presbyterian Church in Gerrardstown was erected in 1797-98. Prior to this time the Presbyterians often worshipped with the Methodists in the upper room of the old Gerrard house. The first church, a plain fifty by forty foot brick structure with windows on each side, was adjacent to a fine stone meetinghouse, which had been built about 1760. The stone meetinghouse is used today as the church office and a meeting place for the adult Sunday school class. The building project was completed in 1817, and a roll book of the “Middle Town Sabbath School Society” lists the names of 270 members that year. The first pastor called jointly with the Back Creek congregation was the Reverend Mr. Joseph Glass of Winchester Presbytery. Records indicate that the cemetery still maintained today by the church was begun during the early years of the churchês existence. During the Civil War, the congregation had no regular minister, no regular services, and no meetings of the Session. In 1866, the roll of the congregation lists eighty-three new members. In 1875, a manse was built on a site adjoining the church property. In 1892, it was decided to tear down the old meetinghouse and erect a new one on the same site. The new Church was identical in size with the old except for the addition of a lecture room and a spire with a belfry. 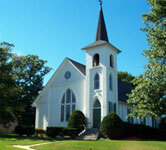 The church was dedicated at a special service held on August 13, 1893. In 1912, the congregation acquired a lot adjoining the manse and constructed a building designed for church and community social activities known as the “Gerrardstown Hall.” It continues to serve the church and community today. Outpost work at Mountain Chapel began in 1915 and continued until the 1990s. The only structural change to the present church was done in 1959 when a basement area was excavated to provide bathrooms and Sunday school classrooms. No longer yoked, the congregation has been yoked to various congregations throughout its existence as it sought to obtain the services of a regular minister. In 1993, the Church celebrated its bicentennial and a new organ was dedicated in 1995. A growing youth ministry began in the late 1990s and continues today. A proud heritage is complimented by the desire to continue the work of the Lord with optimism and hope in our growing community.